March 2nd, 2013 -- Join Us! Pacific Islanders across 15 Pacific Island nations and territories will come together in mass numbers on our islands, mobilising at prominent locations to perform our unique war challenges, songs, and dances. We will carry a single message that will make our voice heard on climate change, and we want the world to listen. We, the people of the Pacific, spread over hundreds of islands stand united by the Pacific Ocean that connects us. Our Warrior dance and chants are to express ourselves and tell the world that we also exist. We will continue to fight for our land, our existence, and our identity that is threatened by the impacts of climate change. We will never give up to climate change. The world needs to hear the voices of our people! It’s 100% Possible for us to be heard. “This is our message to the world that we stand in solidarity against the unwelcomed global reality that is climate change. We understand that the climate crisis is claiming our livelihoods but we will be silent no more. No longer will we act as the victims." A group of traditional stick dancers will be performing the jobo dance on Majuro, lagoon side of the Bokenake area. This is a traditional fighting dance from the atoll of Utrik, to show the determination to fight for the atoll islands and unique cultures of the Marshall Islands - despite the threat of climate change. Launch of the Na Bole (Fijian Warriors Challenge) video clip composed and choreographed by Fijian cultural icon Manoa Rasigatale. The Na Bole is titled “Maroroi Vuravura” meaning “save the earth” to showcase that Fijians are proud, resilient and determined, and together can be proactive at meeting climate change impacts as they happen and can build a movement that can create climate change solutions the Fiji way. It is 100% Possible With You! 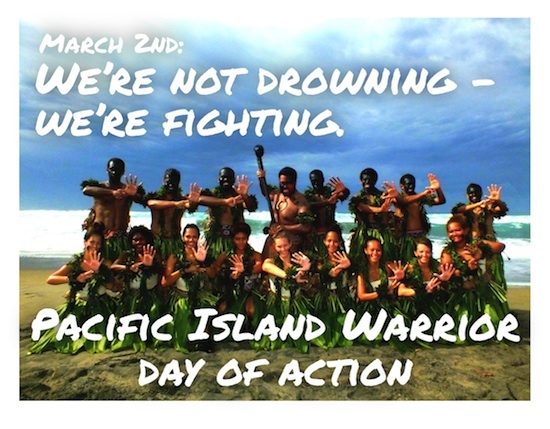 The launch of the video clip will be followed by a massive online/ social media push for people in Fiji and around the world to join the campaign and set the platform for the other Pacific Islands on March 2nd. Performance of the Takalo/Warriors Challenge lead by young males and the females will perform a dance/chant at different locations around the island to highlight the unique language, fighting spirit and resilience of the people despite the many challenges climate change poses to the island. Performance of the Tokelau Warrior Dance at Sunset featuring the Kai Te Geli Dance Group to make its people's voices heard in solidarity with other Pacific islands to continue to voice out the impacts of climate change. This will be a historical event for Tokelau as the whole island will be involved in the day of action. Performance of the Rosa dance to show that the people of Vanuatu will not admit defeat to climate change impacts - but continue to rise against its impacts. Performance of the Haka at Sunrise with to demonstrate the fighting spirit of the Kingdom from the effects of climate change. The first-lady, Madame Meme Tong will officially launch the day of action with an inspiring address to the people of Nanikaai Village, Kiribati This will be followed by the a day of activities and finish with a powerful, 1000-people strong warriors challenge at sunset to show that people of Kiribati are fighters - never giving up to climate change. Performing a traditional dance emphasising the unified stand of Solomon Islands young people and challenging the global community to give climate change the seriousness that it demands and to reiterate that the stories of those in the frontlines of the impacts of climate change will not go unheard. What: Performance of the Manu Siva War dance members of the Manu Samoa rugby team and 200 plus pre-schoolers to inspire the world that it’s time to listen and take action on climate change to give the children of the islands a future which they so rightfully deserve. Performance of the Trebkul War dance to challenge the the developed nations that they are damaging the livelihoods of the poeple but they will not stay silent - they will be heard and fight for their islands. I stand alongside the Pacific Islands in the fight against climate change.